The SEO industry changes constantly. Anyone involved in web design and development would agree that search engine optimization is difficult to keep up with because it changes so rapidly. Ripe has seen, however, that what drives rankings in organic search today is largely the same as it has been for the last 10 years or so: Links and Content. 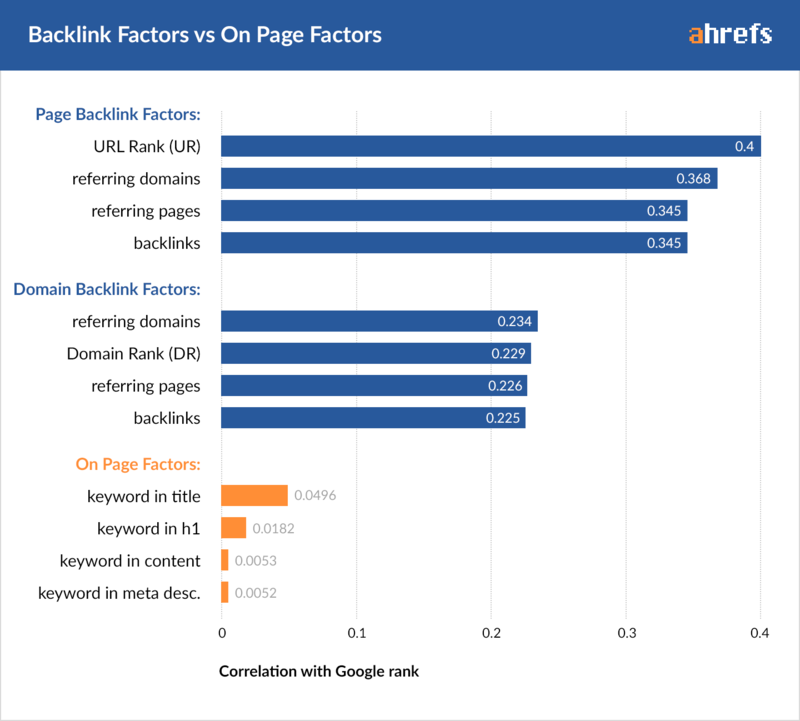 As this chart makes clear, inbound links are still the number one driving factor for rankings—both for individual pages and for the domain as a whole. So, while it may seem like SEO changes all the time, some things haven’t changed much at all. That said, it’s always smart to prepare for the future. In the last few years, Google put a lot of effort into trying to understand content and users’ search intent. With their Hummingbird algorithm, they’re taking large leaps at trying to better understand everything that surrounds any given topic. Google’s main goal is to match user search terms to the best possible answer(s). If Google can rate a document based on the likelihood that it will be the best match to the user search terms, that will certainly impact search engine rankings. This is why the actual content on the page has always been important, and why it grows more important each passing day. Search engines are getting smarter. More and more they are able to evaluate the intent behind search terms and can group searches based on that intent. Because of this, content shouldn’t just focus on each individual keyword, but on building pages around particular topics. Previous to this shift it was beneficial to create separate pages for each keyword, but now those separate pages are likely to be evaluated as the same thing. The result is that we can create a single page and still rank for many of the variations. Perhaps, in the future, if Google can understand content even better, inbound links may not be as they are today for ranking. We have reason to believe SEO is heading in this direction but that’s not the case at the moment. Based on the above, it’s evident that the best way to rank in Google right now and increase your website’s traffic is to become an authority on a specific topic. Long articles are better than short ones. When possible, get your word count up above one thousand words. We know that isn’t always possible. We also know that user attention spans and availability can’t always handle 1,000+ words at a time. This is simply a target, and it’s not the only factor anyway. More articles are better than a few. The more ground you cover under a specific topic, the more your articles will be seen as an authority on that topic. Of course, this doesn’t mean you should copy and paste the same content into multiple articles. Search engines are smart enough to figure that out and will in fact penalize your site for such things. Instead, try to go deeper into one aspect of a particular topic for each of your articles. Ripe can help you with all of the above. Check out our SEO Services and feel free to ask us anything. We’d be happy to help you see the possibilities. In the past, SEO meant building up keywords and improving ranking. In today’s search market this is a really narrow view and and isn’t inline with how SEO works these days. If links were the biggest ranking factor, it would be difficult to achieve success. SEO today is more about traffic instead of rankings and topics instead of keywords. It takes into consideration the customer journey. The majority of web searches are about finding information before a person is ready to buy. Building out that quality content will allow you to capture more traffic and position your site as an authority, which will go a long way to building trust with your target audience. And, if all goes well, that should mean more money, too! Here, again, is where Ripe can help you see significant gains in targeted traffic, leads, and sales. We always start with a brief audit on your site to see if there are any underlying issues. You wouldn’t want to build a house on a shaky foundation. If a website’s traffic has dropped from what it once was, we’ll check and see if the site has been penalized. We’ll also check Google Analytics to investigate any sudden traffic drops. One tool we like to use is this Google penalty checker which will show a graph of your traffic compared to all the major Google updates. With this, we will be able to see if there have been major drops in traffic at the same time as an update came out, which can signal what may need to be fixed. Some penalties are harder to recover from than others. We don’t recommend spending a lot of time trying to recover a heavily penalized site as some just won’t recover no matter what. Define Your Target Audience: Who Do You Want To Attract? We’ll cover those in more detail in another post. For now, don’t hesitate to contact us with any SEO questions you might have.